I use the term "trend" loosely because let's be honest....I'm not Vogue magazine. LOL However, these are pieces and looks I have seen over and over from various retailers, brands and designers so I thought I would identify the ones that were my favorites. While Velvet is traditionally a standard fabric for fall and winter, I have seen so many variations this year with it. Hats are not a trend but some of the styles that are emerging for fall are ones that are a bit different than a regular fedora or beanie. The fisherman/fiddler cap is everywhere now and there are so many great ones at affordable price points so you can add this trendy piece into your look without breaking the bank. Embroidered and embellished pieces are again something that typically pop up in the colder weather, but like velvet there are tons of variations this year. And it's a fun way to make a regular ol' piece of clothing (jeans/sweater/flats) a bit more exciting. Blazers aren't a trend per se, but I have seen a ton of oversized blazers popping up which is a bit more trendy than classic. Plaid for fall - groundbreaking. But regardless of how overdone it is each season, I still see it everywhere this year and it's something that's wearable and easy to keep for years to come. Oversized cardigans have been around for years, and frankly they are not going anywhere so it may be worth grabbing one or two as a great transition piece or layering piece when it gets colder. And finally, ankle boots. You may think I am crazy for including this as a "trend" but over the past few years I saw a ton of over-the-knee or thigh high boot styles being more prominent but this year it is nothing but ankle or mid-calf. And if you want to take this to a more trendy place, purchase a fitted or sock style ankle boot. 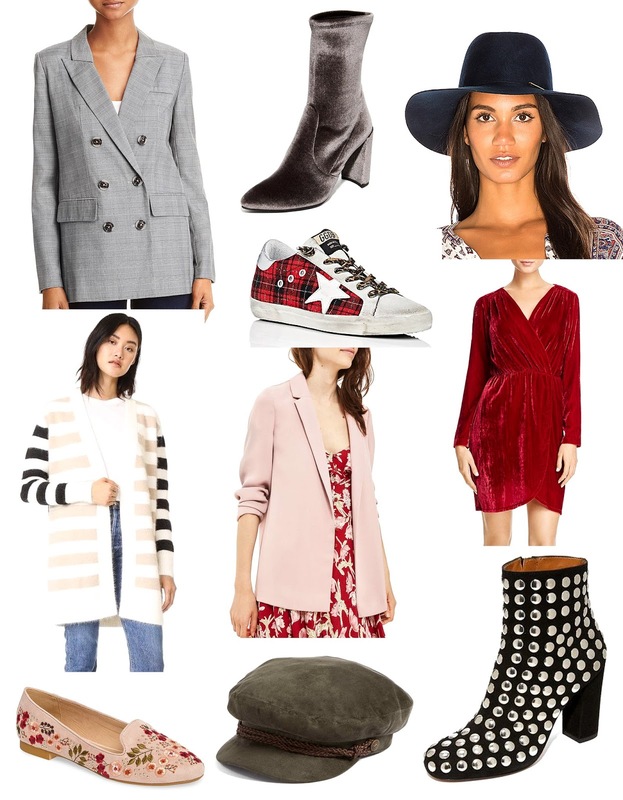 Scroll through each trend below for pieces that would be great additions to a fall closet!